Kuala Lumpur Sentral was designed by award-winning Japanese architect, the late Dr. Kisho Kurokawa, whose other works include the Main Building of the Kuala Lumpur International Airport; Melbourne Central; Oita Stadium in Oita, Japan, one of the venues for the 2002 World Cup; the Osaka International Convention Centre; the Toyota City Stadium, in Toyota, Japan; and Republic Plaza, next to Raffles Place in Singapore and winner of the World Best Architecture 1997 Award by FIABCI. Stesen Sentral itself has won the Specialised Public Sector Development 2002 by FIABCI-Malaysia. In year 2003, Kuala Lumpur Sentral was bestowed further honours as one of the world''''s best projects in the FIABCI-International''''s Prix d'''' Excellence. 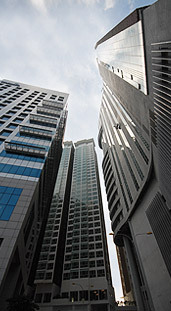 Most recently, 1 Sentral won the FIABCI Malaysian Chapter Property Award 2008 for the Office Development category. Kurokawa, a foremost thinker and architect, possessed a keen sense of aesthetics, evident in all his projects. A common denominator in his designs was the emphasis he placed on the human element. Kurokawa was well-known for exploring the notion of engawa, or the "in between space", where public realm and private space co-exist in harmony.